EmmaRobb offers one of the largest selections of English laces available online. English Leavers laces are manufactured by experienced lacemakers using 19th century patterns and leavers machinery. 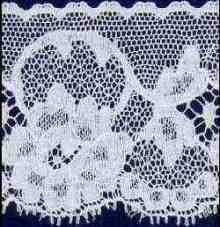 Often called Nottingham Lace, it is made from the finest thread and is surprisingly sturdy. The patterns are intricate, including flowers, leaves and stems with multiple netting patterns used to connect the floral elements of the design. The sheer beauty of English Leavers laces, when added to a simple design, can create a garment that will be cherished for generations.